I suppose I can thank or blame my wife for this obsession I call a hobby. About 20 years ago, she brought home a broken down old radio she found at a garage sale. She thought it would be a good winter project! More than a thousand radios later, I have a collection of about 350 radios, countless tubes, early speakers, and other related radio goodies from radios heyday. Over the past couple of years, I have started doing repairs for others and have now decided that I would like to make this service available to everyone. 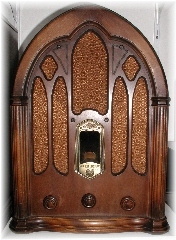 My main interest has been wood and bakelite radios from the thirties and forties, though I do have a little bit of everything from the early twenties on into the sixties. I also dabble in tube hifi as well. I have a couple of HH Scott pieces, a Fisher 300A, and some Dynaco pieces. I have also built a pair of 300B mono blocks. I really enjoy bringing a radio back from its long hibernation! I sit there listening and wonder about the people that owned it for the very first time and how excited they must have been the first time they turned it on.